San Antonio, Texas, may well be the most fought over city in the United States. Located in South Central Texas. Six National Flags have flown over San Antonio (a couple of them more than once): Spain. 1519-1685 and 1690-1821; France. 1685-1690; Mexico: 1821-1836; The Republic of Texas: 1836-1845 Confederate: 1861-1865; and the United States: 1845-1861 and 1865-Present. Texas was the 28th State in the Union. 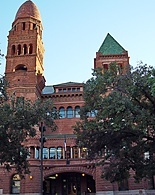 San Antonio has been the county seat of Bexar County since 1860. 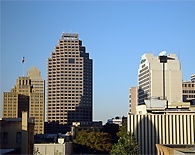 San Antonio has seen an increase of population of 2 percent per year during the past decade. The figure stood at 1,144,646 in 2002. As befits an important military center, In 1858, the US Army chose San Antonio as the location for a permanent Arsenal, and in 1878 the city deeded ninety acres to the federal government for Fort Sam Houston. During World War I, Kelly and Brooks fields (later Kelly Air Force Base and Brooks Air Force Base) were key sites for pilot training. Jack Hays' Minute Men, the Civil War vigilantes, the famous Belknap Rifles (named for Augustus Belknap, who helped form the company after admission to the San Antonio Rifles was refused), and the Alamo, are milestones in the life of San Antonio. Named for San Antonio de Padua in 1691, San Antonio's history is also Texas history. From a mission church through it's term as the capital of the province of Texas, San Antonio has been the key for shipping, supplies, and military operations (including Revolution). In 1811, the center of revolutionary activity against Spanish rule, in 1813 San Antonio was seized and Texas proclaimed an independent state. Confiscation, detentions, and executions followed until Texas forces occupied the city of San Antonio in 1835. 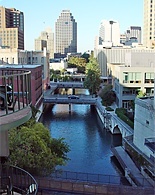 San Antonio has a diversified and well established economy. The subtropical climate has spurred agriculture with a growing season of about 265 days a year. Income from tourism began in the 1890's, with Hot Sulphur Wells drawing distinguished guests from the Midwest and the East Coast. 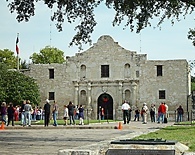 The Alamo is one of the most visited attractions in Texas. Oil has contributed greatly to prosperity since its discovery in Bexar County in 1889. The Witte Museum (est. 1926 and located across the street from the Courthouse) presents an online Visual History of San Antonio. The Museum houses an extensive collection of historic Native American objects, archaeological artifacts, vertebrates and invertebrates from South Texas, gems and minerals, fossils, and live Texas animal specimens, textile and costume exhibits including quilts, clothing, and accessories from the early 1800s, as well as Texas art, furniture, decorative arts, firearms, western memorabilia, photographs, documents, etc. The restored 1795 Ruiz House, the 1835 Navarro House, the 1841 Twohig House, and two log cabins are located on the museum grounds. 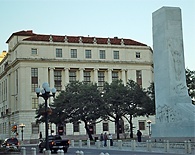 Bexar County has had a system of courts since the Texas Constitution was adopted (1836). In addition to 228 District Courts, there are six county courts at law, five Justice of the Peace Courts, the District Attorney, the County Clerk, and the District Clerk located in the Bexar County Courthouse today. The legal profession contributes greatly to the economy in Bexar County and San Antonio. The San Fernando Cathedral, the first parish church in Texas (cornerstone was laid in 1738), plays a vital present as well as historical role in the life of San Antonio. Typically, over 4,000 congregants will attend weekend Masses here, where Presidents and the Pope have attended. The Riverwalk is the second most visited attraction in the state of Texas (only second to the Alamo). See San Antonio by water, while taking a riverboat ride. The Alamodome sponsors sporting events, boat shows, quad wars, and monster truck racing. Six Flags Fiesta Texas is America's top show park. La Villita, (Spanish for little town), is the original settlement of Old San Antonio and comprises one block in downtown San Antonio. While there, have dinner at the Tower of the Americas, and be sure to see the Botanical Gardens, San Antonio Zoo, Sea World, and SplashTown.